Colton and I had only been sleeping for maybe an hour and a half before I woke up to a cramping sensation and urge to go to the bathroom. I got up, went, came back to lay down, and fell asleep again. I woke up to a slight “leaking” sensation. I went to the bathroom again, emptied by bladder, and the stream continued. Without going into too much detail, a few other signs were going on down there so, I yelled out, “Colton!” …No answer… I yelled out again and he confusedly asked, “Huh? What?” “I think my water broke!” I yelled. “Yeah? !” he asked. “Pretty sure,” I stated. I was having pressure waves (term for “contractions” in Hypnobabies) approximately every 5-8 minutes when Colton was talking to Madison, so she told us to try resting some more, keep track of my progress, and to call her when we thought we needed more support. Within 20 minutes, they were already coming every 2-3 minutes and increasing in intensity each time. My body went into the “clear everything out” mode so I couldn’t even leave the bathroom to try movement or position changes with my waves (I owe sitting on the toilet during this time to some of this early, quick progress). We called Madison again and she told us to call the midwife on call and let them know what was going on and that she’d be on her way. Colton called the midwife, updated her on my progress, and put the phone close to me as I worked my way through another wave. She told us to start driving to the birth center if things increased in intensity/frequency within the next 30 minutes. Madison arrived approximately 30 minutes later and determined we should start making our way to the birth center. Colton quickly gathered our things while Madison helped me into my clothes and supported me through the waves as I continued listening to my tracks. We got into the car and Madison put my tracks on through my earbuds so, I could maintain my hypnosis. According to Colton, we hit every single red light on Marksheffel Rd. at 0500 in the morning. The ride is a blur to me. We made it to the birth center. 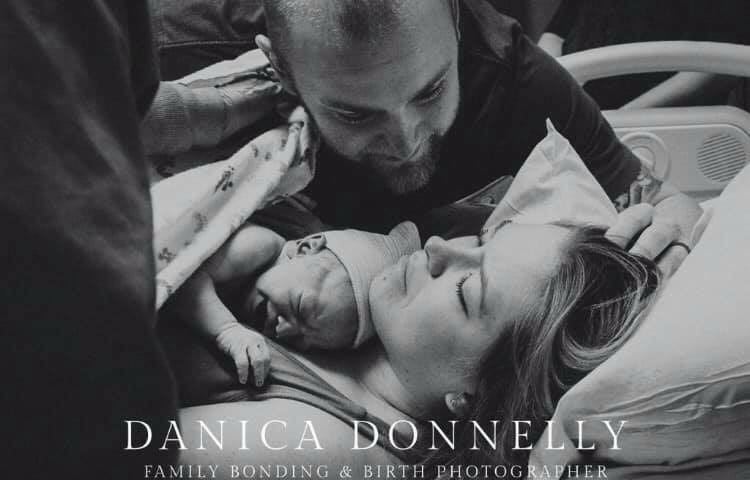 Our birth photographer, Danica, was waiting in the parking lot for us. Before I was able to walk up to the center, I had to make it through one more wave in the car. We then walked to the front door, rang the doorbell, and another wave hit at that moment. I worked my way through that wave as we were greeted by Lizzi, the midwife, and she escorted us into the birthing suite which was already prepped. The bath was filled with warm water and the lights were turned down low. I got out of my clothes, used the restroom again, and stepped into the birthing tub where I stayed for the next couple of hours. Colton switched my tracks to the Bluetooth speaker in the room and then got into the tub with me. My sweet husband sat on that hard step into the tub for probably two hours supporting my weight from behind and applying counter pressure to my low back as things continued to progress. the tub, according to Colton, for almost 2 hours. I tried pushing while leaning over the edge of the tub, I tried hands and knees, I leaned on Colton, and I also tried a sling that the midwives hung from the ceiling for me to support myself in the squatting position in the tub for more power. (At some point during my time in the tub, the midwives changed shifts and Jen and Amy were now my midwives.) Jen sweetly told me that we’d been in the tub for a while now and that baby may need to try a different position outside of the tub. She suggested the side-lying position in the bed. I agreed and made my way out of the tub slowly. My team dried me off super-fast, so I wasn’t cold, and I attempted a few pushes in the bed. I told them I wanted to try something else and so they suggested the birthing stool. The stool was great and really allowed me to put a lot of power behind my pushes. AMR arrived. No baby. The midwives then attempted twice to start an IV on me prior to being placed on the stretcher but were not able to get a line. I was then whisked out of the birth center and into the back of the ambulance. I remember hearing pieces of a conversation Colton was having with one of the AMR staff about coming in the ambulance with me and, unfortunately, he was told he had to drive himself there. He reached into the back on the ambulance, touched my leg, told me he loved me and that he’d see me there. He drove both Madison and Danica to the hospital while my midwives stayed with me. I remember having two pressure waves in the ambulance (my hypnosis tracks were no longer playing but I was able to use a technique called, “finger-drop” to induce the hypnosis myself and I used my “Peace” cue to direct my comfort “hypno-anesthesia”, or comfort, to the places I needed it in my body). I stayed very much in my zone with my eyes closed for the majority of the transfer, opening them only intermittently. We arrived at Memorial North and I was transported via stretcher up to a labor room. I was greeted by the most amazing team. There were, I think, two labor nurses, one baby nurse, and the OB which the midwives had been in contact with about my transfer. Colton, Madison, and Danica had also made their way into my room. One of them placed my earbud into my ear and I was able to resume my birthing hypnosis tracks. I was hooked up to the external monitors for the team to monitor my baby and the nurses began taking shots at getting an IV on me. Eight sticks later and they finally got one. The OB told me he wanted to see how the baby was handling my pressure waves and pushing so he allowed me to work through two as everything was going on. I could feel and see (they placed a mirror in front of me as encouragement during pushes) how low and close my baby was to being born. But he/she was now having deep decelerations so the OB told me that he thought it was time to have a baby with assistance via forceps. I remembered asking him about a vacuum instead. My primary nurse leaned over to me and sweetly said, “He is extremely skilled with the forceps and does a great job,” and one of my midwives said, “Let the artist choose his instrument.” I was so thankful for this reassurance and felt like it was all going to be okay. He placed the forceps and told me, “With the next wave, give me a big push.” The pressure from the forceps was so great that it immediately caused a wave and I pushed as hard as I ever had. I gave birth to the love of my life. It was in our birth plan for Colton to announce the baby’s gender, so he looked at me and said, “We’re having a girl!” I looked back at him and said, “We’re having a girl!” Little Miss June Kimberly was placed delicately on my chest and was crying. Despite how she looked on the monitors, she transitioned so well and was able to stay with me on my chest for two hours! She latched on in 2 seconds and stayed there for 90 whole minutes. I was so enthralled with finally having her out and soaking the moment in that I barely noticed the work the OB was doing down there … I could continue on in detail about what happened after that, but all that I truly care to mention is the extraordinary level of care that June and I received during our entire birthing time. Colton was the BEST birth partner. Madison was the BEST doula. Danica was the BEST photographer. Our midwives were the BEST. The team at the hospital was the BEST. The OB was the BEST… Ahhhh! I don’t care that our birth plan had to change. Hypnobabies not only taught me how to feel confident in myself and my body throughout my pregnancy and during my birthing time, but it also taught me that the birth my baby and I were going to experience was going to be perfect for US. And it was. I wouldn’t change a thing. I am still in awe and will be for the rest of my life, with how beautiful those 10 hours and 42 minutes were.